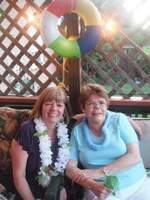 Provide comfort for the family of Teresa Overall with a meaningful gesture of sympathy. Passed away at Lakeridge Health Oshawa with her family by her side on Thursday March 7th, 2019 at the age of 82 after a short battle with lung cancer. Much loved mother of Tracy Anthony and her husband Wayne of Whitby and Bradley Overall and his wife Sandy of Whitby. Cherished Nana of Caitlyn, Kirsten, Jada, Sawyer. 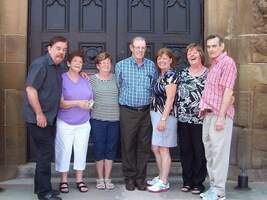 Loving sister of Bernice (late Desmond), Lawrence and his wife Freda, Henry, Rosalie (John), Albert and his wife Nancy, Rita and her husband John. Fondly remembered by many wonderful nieces, nephews and their families. 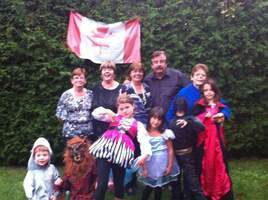 As food allergies impacted her loving grandchildren, donations to Food Allergy Canada would be greatly appreciated. Visitation at Barnes Memorial Funeral Home, 5295 Thickson Rd. N. Whitby on Sunday March 10th from 2:00 – 4:00 p.m.
Then to St. John the Evangelist Catholic Church, 903 Gifford Street Whitby for Funeral Mass Monday morning (March 11th) at 10:30. Teresa will be laid to rest beside her husband at Assumption Catholic Cemetery, Mississauga. We encourage you to share your most beloved memories of Teresa here, so that the family and other loved ones can always see it. You can upload cherished photographs, or share your favorite stories, and can even comment on those shared by others. Bev, What a lovely post. Teresa sure would appreciate that. She loved family get together times and held alot of them at her house especially in the early years. We all have great memories as you also do. Thanks for sharing. I didn't know the young woman who left home at such a young age and moved into Charlottetown and then onto to Montreal. I never met the woman who went to a New Year's Eve party so long ago and fell head over heels for a young Frank Sinatra look alike and then who followed her love onto Brampton, despite her mother's ' wishes. I didn't know this woman in 1969 when she gave birth to me and 4 short years later gave birth to my little brother. I was too young and self absorbed to know a lot about this woman, who despite a lack of a formal education started her own business and did well at it. What I do know is how fiercely proud our parents were of Brad and I. We never doubted for a second how much we were loved. Our parents strongly influenced who we are today. Mom used to say "how did I get such great kids? and we would say - duh! it was you guys. It was how we were raised! It didn't just happen by accident. In the 1960 and 70's my mom was a nursing assistant in various nursing homes. It was her stories of helping and caring for the elderly that made me want to be a nurse. I will always think of mom when I see a beautiful rose garden, a good tea biscuit, great date square or a grandmother spoiling her grandkids. My mom was supposed to die - she had to - like we all have to at some point. I was blessed to be her daughter. Her and my father saw me take my first breaths and I was blessed enough to be there for their last. I'm glad Jesus has called her home. She's out of her tired and tattered body. She is fine where she is now. I have no doubt that I will think of her and cry often but there is a peace I feel knowing that she is without pain, breathing well and I fully believe that she is happy now in heaven with my father. Thank you Anthony. Beautiful tribute to Teresa because she was always that kind and loving though her life. We will miss her very much but so we know she is happy in her eternal home with Frank, Mom & Dad and other family members that went before her. Thanks for sharing. Rosalie. Rest easy, dear sister, your suffering is over. You have earned wings and are now reunited with your loved ones. I will remember you as the big sister who left home first and showed the rest of us how to take our place in the world. I will miss your laugh and your joy for life. We will meet again and what a joyful reunion that will be. Dearest Teresa, You were the most loving kind person and when I came to Toronto, you were my 2nd Mom. Could never have managed those times without you and many times since. Your gentle love & guidance will always be missed and your deep faith which you lived fully. You always believed things happen for a reason and trusted in the Lord. You were so loved by everyone of our Family and that is saying something coming from a Family of 7. You were so blessed to meet the love of your life, Frank and then to add your precious babies. OH, What joy!! You both so much enjoyed bringing them up and were so proud of them. They are gems and carry your legacy over to their Families. How do we carry on without you will be such a heartbreak and everyday challenge. We will love you forever til we meet again. May God hold you in the palm of His hand. love always & 4 ever. Rollie.